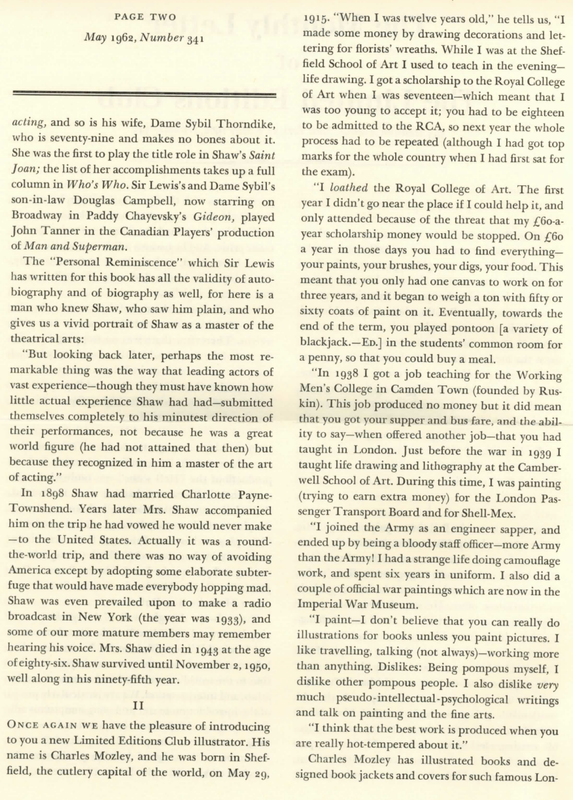 Introduced by Lewis Casson, and features Shaw’s own Preface to the play. 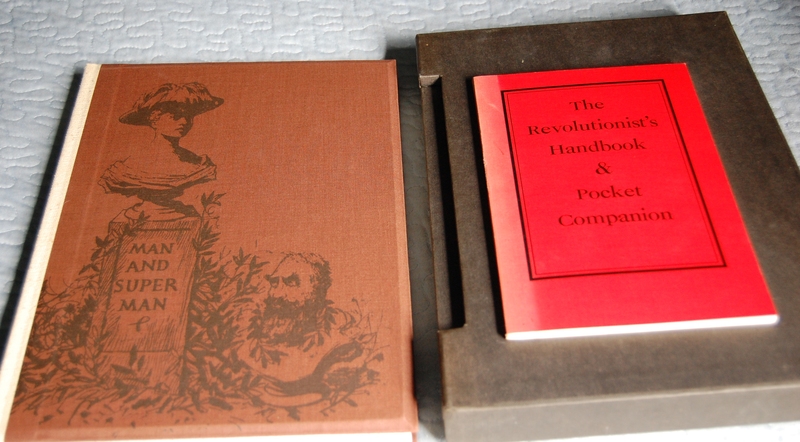 A supplementary booklet, also by Shaw, the “Revolutionist’s Handbook & Pocket Companion“, is included. 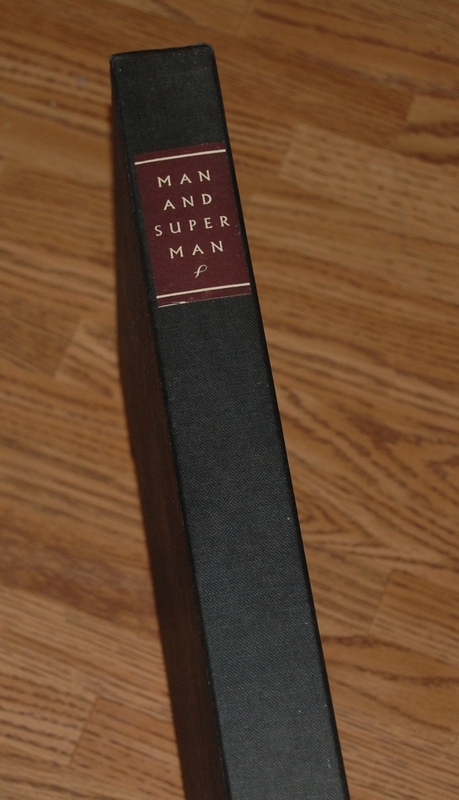 Binding, slipcase and bonus booklet – Man and Superman is one of George Bernard Shaw’s more notable plays, and the Limited Editions Club rendered it in a most glorious fashion with this book. On top of the lavish tome of the play, this edition came with a copy of character John “Jack” Tanner’s Revolutionist’s Handbook & Pocket Companion, which had its own special slot in the slipcase to be stored. Unfortunately, my copy has seen its fair share of sun. 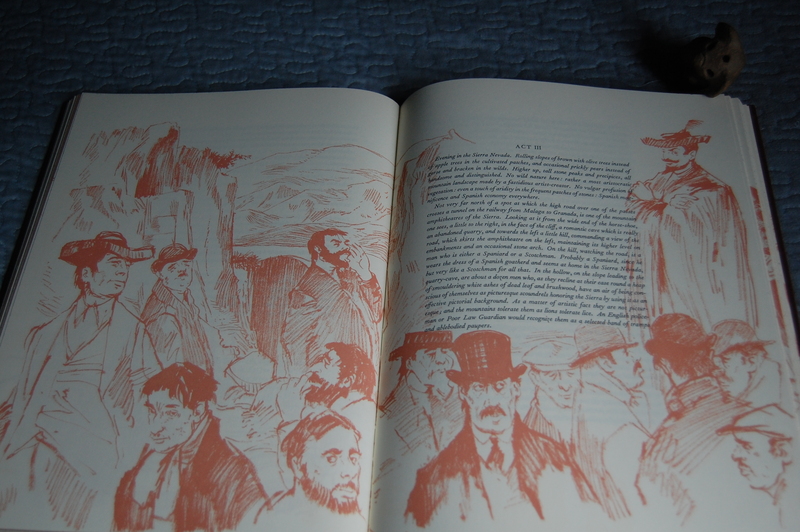 The front and back covers are identical, and is graced with Charles Mozley’s excellent artwork. Shaw’s publishing history with the George Macy Company began back in 1939 with the LEC exclusive Back to Methuselah, featuring John Farleigh’s artistic talent. Shaw was still alive then, making it one of the weird instances the LEC issued a work from a contemporary author. Farleigh has been featured on this blog since since this post originally appeared: the lovely Prometheus Bound/Unbound and the Heritage Histories of Shakespeare. For some reason, following Methuselah, the George Macy Company — under George Macy — did not issue a second Shaw production. It would fall onto Helen Macy, his widow, to return to the legendary playwright once more with Man and Superman. Mrs. Macy would release a third Shaw in her tenure, Two Plays for Puritians, which stars The Devil’s Disciple and Caesar and Cleopatra, colored with the bright illustrations of George Him. Cardevon Press would release the fourth and final Shaw title, a combination of Pygmalion and Candida, with Clarke Hutton doing the visual honors, in 1974. This was Charles Mozley’s first LEC, and would go on to render The Man of Property by John Galsworthy, H.G. Wells’ The Invisible Man and Alexander Pushkin’s The Captain’s Daughter and Other Stories for the LEC. Very talented fellow, although a bit pugnacious, from what I’ve heard. Title Page – This is Ann Whitefield and John Tanner in the front, the two leads. 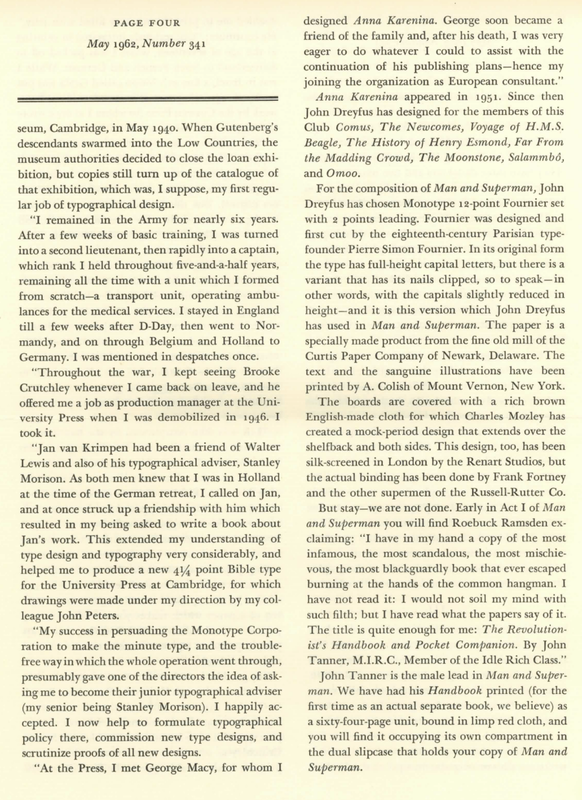 Lewis Casson wrote the introduction. 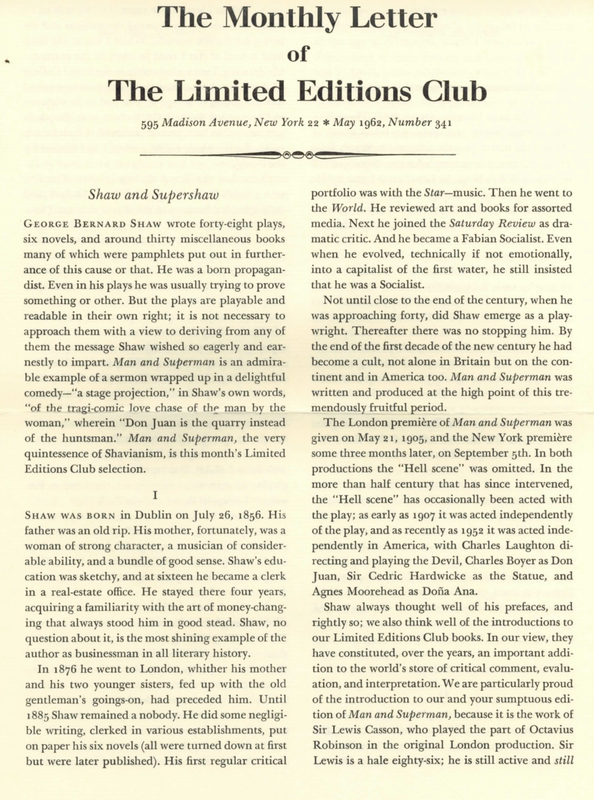 The book also includes Shaw’s original preface of the book, which was a letter written to his critic Arthur Bingham Walkley regarding the reasoning behind Man and Superman’s existence (a question Walkley proposed to Shaw well before Shaw’s execution of this play, which was “why haven’t you written a play about Don Juan?”), He pretty much tears Walkley apart with his superb wit. 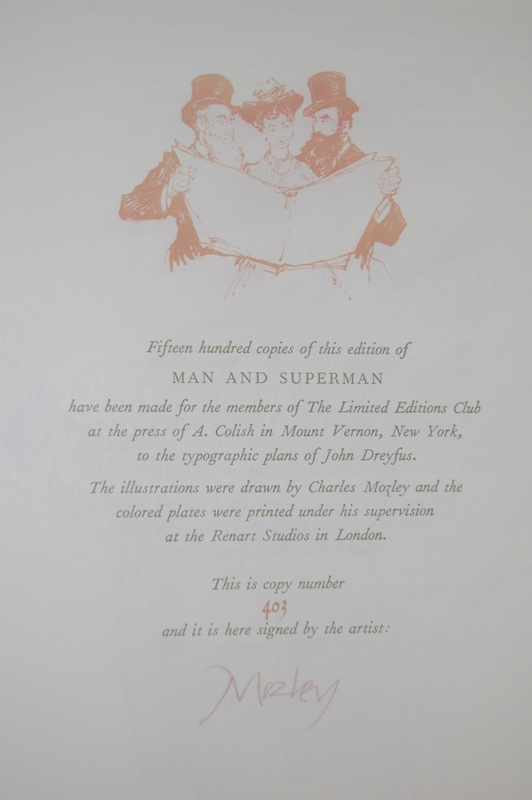 Colophon – My copy is #403 out of 1500 (the same number as several of my books, which I bought at the same shop), and is signed and numbered by Charles Mozley. Well, I’m assuming he numbered it judging by the two sharing the same color of ink, but I may be wrong. This picture is a little light, which is my error. 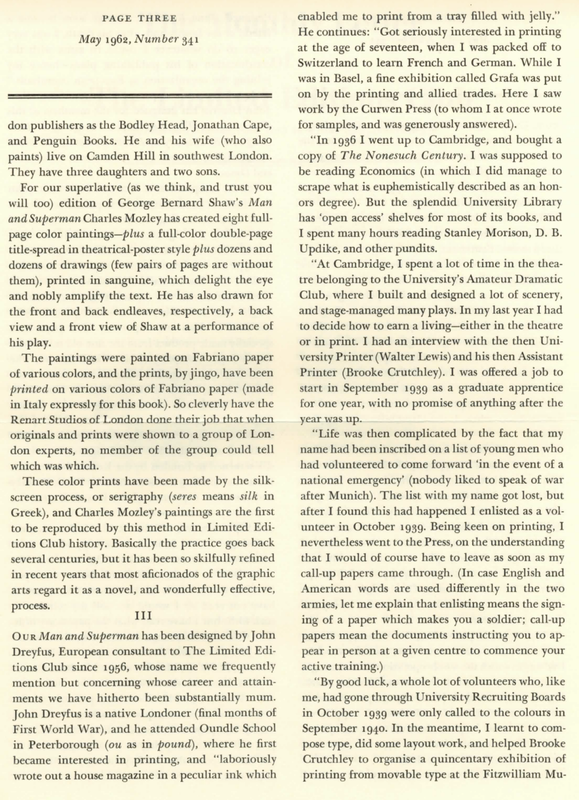 Page 7 – Another example of Mozley’s paintings. They work quite well with the text. 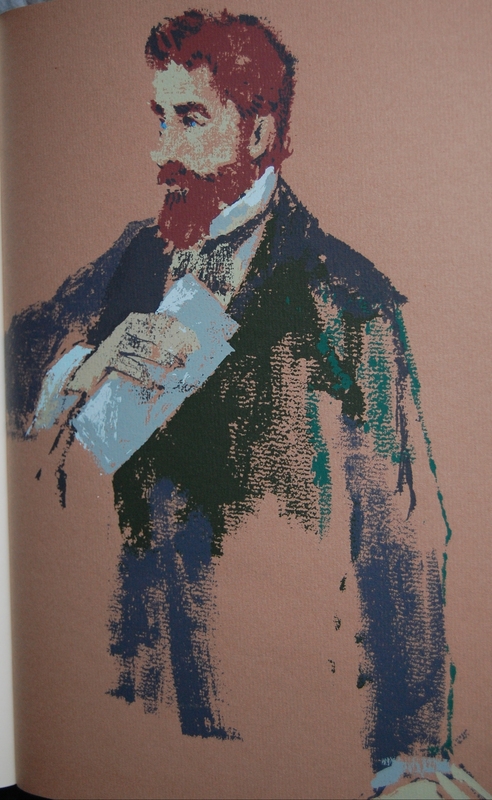 Page 57, 58 – Mozley’s sketches adorn many pages of the text, and are simply wonderful. 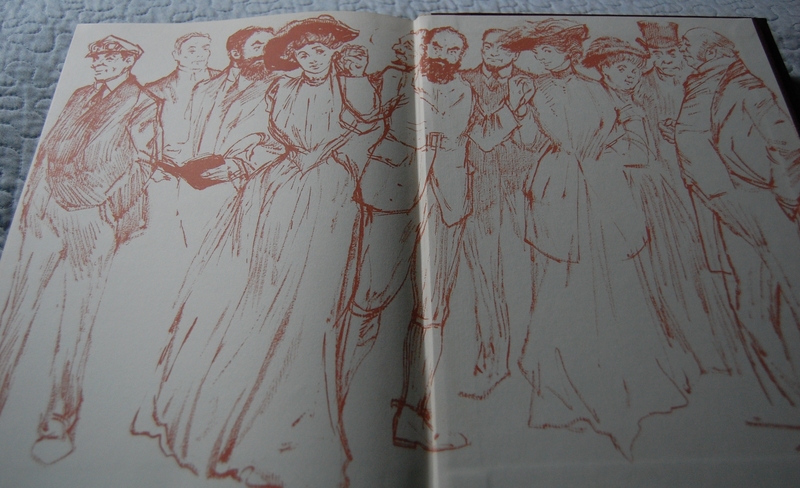 Back endpapers – Curtain call! Personal Notes – This was my very first Limited Editions Club book, purchased at Bookhaven in Monterey, CA. I just finished reading it two days before the first edit of this post, and it’s an fantastically written play. I think Mozley’s illustrations made the experience even more pronounced. I consider this to be one of my favorites, both in drama and in terms of my collection. I’d like to get the other three LEC’s of Shaw’s work, so those are on the top of my To-Get list. 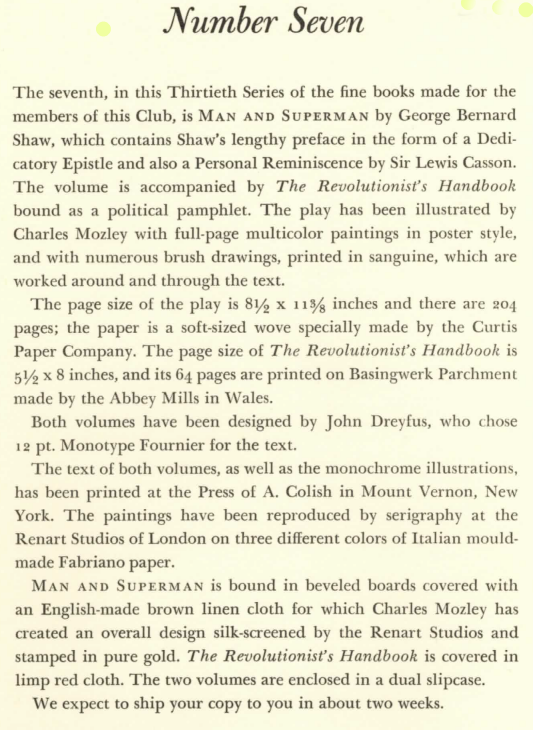 You are currently reading Limited Editions Club: Man and Superman by George Bernard Shaw at The George Macy Imagery.